Some Kindles now have a Translation function! 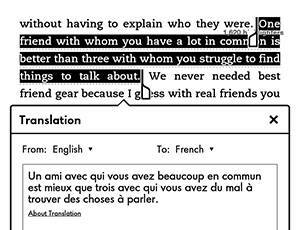 If you are reading a book with foreign language dialogue, you can now translate it. While reading, you can select text and then use Instant translations to translate the text to a different language. Press and drag to highlight the text you want to translate. In the pop-up menu, tap More, tap Translation, and then select the language to translate the selection into. This uses Bing Translator, and will prompt you to turn on your wifi/ 3G. It will auto even auto detect the language of the text. Outlander fans - no Gaelic, I am afraid!